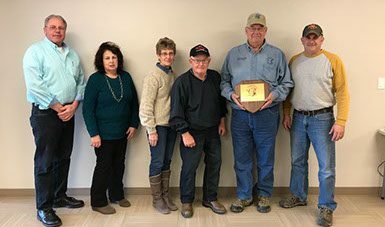 The Allamakee County Conservation Board would like to thank Dennis Blocker for his service to the Board. Dennis served on the board from 2003-2018 and was the President of the Board for the majority of that time. Through his leadership and vision the ACCB completed major projects throughout all of the ACCB's areas including the Driftless Area Education and Visitors Center. As Dennis steps down the ACCB would like to welcome Jesse Delaney as its newest member. Pictured left to right are ACCB members Dennis Koenig serving since 2014, Jeanie Carroll serving since 2013, Marilyn Clark serving since 2012, Bill Moody serving since 1989, Dennis Blocker serving 2003-2018, and Jesse Delaney serving since 2018.